WASHINGTON (AP) — Spilling out wrenching tales of lost lives and stolen security, students and parents appealed to President Donald Trump on Wednesday to set politics aside and protect America’s school children from the scourge of gun violence. Trump listened intently to the raw emotion and pledged action, including the possibility of arming teachers. Trump promised to be “very strong on background checks.” And he suggested he supported allowing some teachers and other school employees to carry concealed weapons to be ready for intruders. But largely he listened, holding handwritten notes bearing his message to the families. “I hear you” was written in black marker. 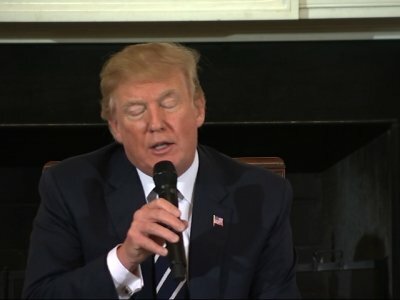 The president had invited the teen survivors of school violence and parents of murdered children in a show of his resolve against gun violence in the wake of last week’s shootings at Marjory Stoneman Douglas High School in Parkland, Florida, and in past years at schools in Connecticut and Colorado. The latest episode has prompted a renewed and growing call for stronger gun control. Trump invited his guests to suggest solutions and solicited feedback. He did not fully endorse any specific policy solution, but pledged to take action and expressed interest in widely differing approaches. Besides considering concealed carrying of weapons by trained school employees, a concept he has endorsed in the past, he said he planned to go “very strongly into age, age of purchase.” And he said he was committed to improving background checks and working on mental health. Most in the group were emotional but quiet and polite. But Andrew Pollack, whose daughter Meadow was killed last week, noted the previous school massacres and raged over his loss, saying this moment isn’t about gun laws but about fixing the schools. The NRA quickly rejected any talk of raising the age for buying long guns to 21. “Legislative proposals that prevent law-abiding adults aged 18-20 years old from acquiring rifles and shotguns effectively prohibits them for purchasing any firearm, thus depriving them of their constitutional right to self-protection,” the group said in a statement. Several dozen people assembled in the White House State Dining Room. Among them were students from Parkland along with their parents. Also present were parents of students killed in massacres at Columbine High School in Littleton, Colorado, and Sandy Hook Elementary in Newtown, Connecticut. Students and parents from the Washington area also were present. Sen. Dianne Feinstein and Sen. Jeff Flake, R-Ariz., said Wednesday they would introduce a bill to raise the minimum age required to purchase rifles from gun dealers, including assault weapons such as the AR-15. “A kid too young buy a handgun should be too young to buy an #AR15,” Flake said on Twitter. A buyer must be 21 to purchase a handgun from a licensed gun dealer. Trump embraced gun rights during his presidential campaign, though he supported some gun control before he became a candidate, backing an assault weapons ban and a longer waiting period to purchase a gun in a 2000 book. The department said its review of whether bump stocks are federally prohibited is ongoing but did not say how Trump’s order would affect that. An effort to pass bump stock legislation last year fizzled out. Senate Minority Leader Chuck Schumer, a New York Democrat, said the bill is “a small step,” but said Democrats want to see universal background check legislation. But Darrell Scott, the father of Columbine High School victim Rachel Scott, said he felt the president had been moved by the group’s words. Associated Press writers Jill Colvin and Sadie Gurman contributed from Washington. Marc Levy contributed from Harrisburg and Alina Hartounian from Phoenix.